You might be familiar with the concept of the television being used to “babysit” kids. Back in my childhood days, my parents plopped me down in front of “Dukes Of Hazzard” and thanks to them, I really love the color orange. Go figure. The days of this television management style are over and I’m seeing trends towards more interactive entertainment thanks to the iPad and other mobile devices. The fact that a smaller one was shown off this week certainly helps Apple’s case to put a device in everyone’s hands. I had the pleasure of chatting with singer-songwriter Alicia Keys today and we talked about the role that the iPad is playing in people’s homes and families these days. It’s all positive, and I’ve personally seen it in action. Since Alicia has a young one of her own, she’s also familiar with the trend, and that’s why she helped build a new app called “The Journals of Mama Mae and LeeLee“, which I will get to shortly. You probably know about Keys from hearing her on the radio, watching her win many Grammy Awards, but the Keys that I chatted with is a mom of a two-year-old son named Egypt. 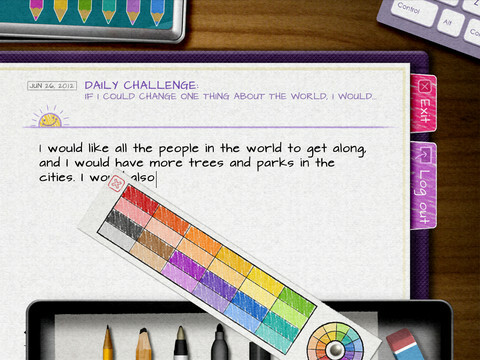 TechCrunch: Can you tell us about the role the iPad is playing in children’s lives these days? Alicia Keys: I think it’s a whole new world and it’s a really cool world and I’m really always amazed by these devices like the iPad because for my son, I love the things I can get for him and there’s so many things that can ignite his mind that use letters and colors, like matching games and puzzles. TechCrunch: The app has a musical component, including your music, can you tell us how important it is to teach children how to play a musical instrument early on? Alicia Keys: My learning experience is to open the mind, putting something into it (an instrument) and getting something out of it. Music is really engrained in the hub of the app, you can see it with the piano in the corner, it’s a way to play around and express yourself. TechCrunch: How else is music infused into the app? Alicia Keys: The music exposes kids to native american cultures and the instruments that goes along with that culture. The flute is a character that is a part of the story and you play a game, which there are musical notes to learn. I want to take kids to India, I want to introduce kids to the music of India. How are they supposed to know about it otherwise? TechCrunch: Kids don’t get plopped down in front of a TV anymore, the iPad is exposing more interactive experiences for the whole family. How does your app do that? Alicia Keys: A main component of the whole concept is that it’s generational. LeeLee and her Grandmother had a wonderful relationship, it’s a special bond that was created and you can see how a grandparent and a grandchild could interact with this app and see how siblings could do it too. Everyone can sit around at once experience it. One of my other favorite parts of the app is the journal, and kids can write in the journal and respond to the questions every day. Like: “What are you scared of?” That’s a cool question. The app itself, “The Journals of Mama Mae and LeeLee” is a storytelling app, but it’s clearly much more than that. It’s an app that will connect families together while the young one learns some important things and has some fun at the same time. 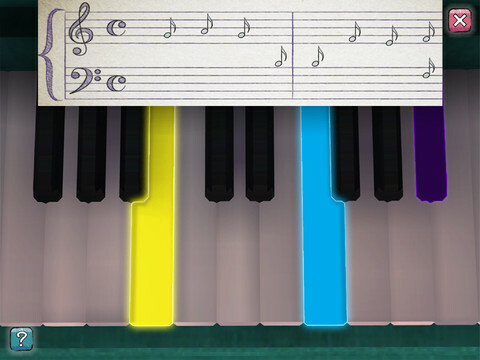 It’s $3.99, includes Keys’ original music and is available for all iOS devices. As far as apps that Keys is into outside of her family life raising little Egypt, she says that she’s a photography nut and has mostly photo apps. She’s also into fitness so she has a few yoga and meditation apps too. What I like about this app is that it has someone involved who is not only a mother, but also a talented musician and entertainer. By bringing all of these strengths together, Bento Box Interactive, its creator, has built something really unique. Keys hadn’t heard of LeVar Burton’s new Reading Rainbow app, but that’s something that also takes the kids away from the TV and gets them to interact with their family in a more fluid way. Even though this is all set up by technology, it’s very human at its core. We shouldn’t fear technology, we should embrace it. After all, we make beautiful music together.